Happy 2018 everybody! It's been a busy month for us, and according to our 2017-2018 report card, a busy year! 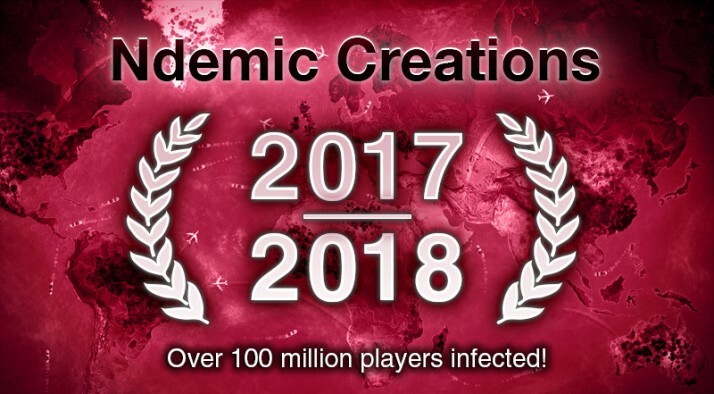 Over 100 million players have now been infected with Plague Inc. worldwide and, for the sixth year running, it's one of the most popular paid apps on iOS (ranked 4th in the USA for 2017)! Fun fact - Players have wiped out earth 1,530,597,131 times, infecting 13,535,648,426,642,177,590 people in the process (as of October 2017). For more fun facts and interesting milestones, you can read our full report card here. Let us know how you're doing! Any big plans for 2018? Let's keep spreading the joy (and the plague). I did not know Plague Inc was so widespread, I will refer to some articles to understand more about this. thank you for sharing! We are aware of some translation issues and are doing our best to get them all sorted out with our translator team. If you spot any bits that are incorrect, please send us a screenshot or post it on this forum so we can make sure we've caught it!